For these scroll to the bottom. Nov. 30, 2011. This morning Public Employees for Environmental Responsibility (PEER) filed a scientific misconduct complaint with the Department of Interior alleging that the BLM intentionally removed study of grazing disturbance from a $40 million series of studies of environmental impacts called Rapid Ecoregional Assessments. I’m trying to laugh them out of the room but this isn’t very funny since livestock grazing is the most widespread and damaging use of public lands, particularly BLM lands. For those who doubt the political influence of the public lands ranching industry and the malfeasance of the agencies created to manage our public lands, here is a glaring example of both. This does not come as a surprise to me since I have been working on this issue for several years but maybe the magnitude of this controversy will rise to a level where the public finally takes notice. Intentional ignorance on behalf of the BLM to the glaringly obvious damaging impacts of grazing has been widespread for decades. 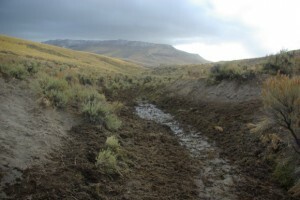 Washington, DC — The U.S. Bureau of Land Management is carrying out an ambitious plan to map ecological trends throughout the Western U.S. but has directed scientists to exclude livestock grazing as a possible factor in changing landscapes, according to a scientific integrity complaint filed today by Public Employees for Environmental Responsibility (PEER). The complaint describes how one of the biggest scientific studies ever undertaken by BLM was fatally skewed from its inception by political pressure. Funded with up to $40 million of stimulus funds, BLM is conducting Rapid Ecoregional Assessments in each of the six main regions (such as the Colorado Plateau and the Northern Great Plains) covering the vast sagebrush West. A key task was choosing the “change agents” (such as fire or invasive species) which would be studied. Yet when the scientific teams were assembled at an August 2010 workshop, BLM managers informed them that grazing would not be studied due to anxiety from “stakeholders,” fear of litigation and, most perplexing of all, lack of available data on grazing impacts. Limit consideration of grazing-related information only when combined in an undifferentiated lump with other native and introduced ungulates (such as deer, elk, wild horses and feral donkeys). Earlier this year, the Interior Department, parent agency for BLM, adopted its first scientific integrity policies prohibiting political interference with, or manipulation of, scientific work. The PEER complaint charges that BLM officials improperly compromised the utility and validity of the Ecoregional assessments for reasons that lacked any technical merit and urges that responsible officials be disciplined. NPR also did a story this morning. 12/2. Update by Ralph Maughan. Since the above news came out, a number of other news media have done original stories. The Impact of Grazing? Don’t Ask. By Felicity Barringer. New York Times. BLMs Largest Ecological Study Ever Fails To Account For Livestock Grazing Due To Fear Of Litigation. By Mead Gruver. AP in The Huffington Post. Did BLM let politics trump science? Group says new study violates Obama’s order to preserve scientific integrity. By Rocky Barker. The Idaho Statesman. Thanks, Ken. This part of the issue that has been an “elephant behind the curtain” ~ to mix metaphors* ~ for a very long time and is one of the methods by which I argue that agencies misguide and misinform the public for the sake of political concerns rather than providing the public with the service they have sworn to provide. I take that concern quite seriously. *I chose to this mix to illustrate the complexity of areas affected by this situation. And I would like to take a moment to thank you, openly, for the work you do on issues of this type. Few have the ability to have the impact you do, I am glad that you are there and doing what you. These things are important and need to see the light of day. Again, thank you. Taking 40 million taxpayer dollars to do a study that is fatally flawed from the beginning strikes me as frankly fraudulent. Ah, the old “pitiful giant” defense. It’s enough to make one lose one’s lunch. This whole thing depresses me. We fight about wolves and elk, when really it seems, there is little hope for either in the long term anyway. The elk habitat will slowly be degraded, wolves or not, logged, mined, grazed, and subdivided by the burgeoning population of the one species that has no controls on its numbers. Clearly, money is most important in this country, just like everywhere else. It doesn’t seem to matter which party is in power, both Democrats and Republicans are bought and sold by the monied interests. Now they’ve succeeded in dividing all of the people that should be natural allies and are playing us against each other over wolves. There is just too much corruption and this BLM issue is a prime example. …only because they had a head-on collision , out there on the public’s graze. Usually , science is ” fenced out” but somebody crawled under the wire , methinks. Just a process story. Not very interesting or brave. Isn’t the BLM’s mission to sustain the health, diversity and productivity of the public lands for the use and enjoyment of present and future generations. What a nice, all-encompassing, feel-good mission statement. It would be cynical of me to think that the BLM cares more about stakeholders like Simplot than it does stakeholders like myself. What a crock. I guess that’s what happens when you hire a rancher as head of the Interior. I put this on Obama. Yeah, it’s kind of like he was made “head rancher supreme” or something similar. Never thought that was a valid choice fr Sec of Interior. If the BLM doesn’t have data on the impacts of grazing then they shouldn’t be grazing. But they do have data, they just don’t want to include it in these studies because it’s obvious that it causing widespread damage to the lands, water, and wildlife. Every ten years, in many cases, the BLM conducts what is called a Rangeland Health Assesment to determine whether the standards for rangeland health SRH are being met. If the standards are being met then they usually renew the 10-year permit with little to no changes. If they aren’t being met they are supposed to determine if livestock use is the cause of not meeting them. If livestock is determined to be the cause then they are supposed to make changes in livestock use and they are required to implement mandatory terms and conditions which will result in making “significant progress” towards meeting those standards. In the real world that is not what happens. I have seen enough of these permit renewals over the last three years to identify trends unique to each of the BLM districts in Nevada and they all game the system to justify permitting all of the AUMs that were on the previous permit. The Ely, Carson City, and Elko districts usually say that livestock is not the problem but that “historic grazing” or horses are the problem. Winnemucca, however, doesn’t even conduct rangeland healt studies even though they are required to do so. They just renew the permits. When writing the Environmental Assessment they say they have to maintain the same number of AUMs because the district Resource Management Plan arbitrarily says that the district has to make available a certain number of AUMs. They use bogus science to say that livestock grazing doesn’t change the vegetation structure. And, because the way that the system is set up, if you appeal a permit and request a stay because the final decision implements a damaging grazing system the judges won’t grant a stay because they would revert to the terms and conditions of the previous permit also known as the “no action” alternative which is to renew the permit without any changes. This is different than what other agencies do. For example, the USFS defines the “no action” alternative to mean that the permit will not be renewed. It’s all a big, ornate scam that is designed to ignore the impacts of grazing so this revelation is not the least bit surprising to me. It’s what they have been doing for decades. And the non-grazing employees of the BLM or forest service are told to shut-up and play along when they see this crap go down. Some don’t keep quiet and are harassed or transferred until they learn to play the game or quit. So much for professional integrity. Sadly, it has become the “American Way”. I would allow any more scientic studies unless they have several equine specialist included involved with the study. These people can be selected as scienctific staff who are horse advocates ,study this species and understand the herd culture. I have not seen any indication that the BLM will change there lack of concern for horses or wild horses because of a historical negative patterns. Another suggestion is to select one half of the BLM board with user friendly horse advocates.